Just like the Irish, the Dutch also take their pub traditions pretty seriously. Bruine cafes (brown cafes) are the Dutch answer to the local - casual, wooden-walled neighbourhood bars, perfect for a snack or a drink. They epitomise the unique sensation of gezelligheid, a feeling of warmth and coziness that has no real translation into English. While living in Amsterdam, I too had my favourite bruine cafes where we spent long nights drinking perfect Heineken from little glasses. On our recent weekend in Amsterdam, we did manage to visit a bruin cafe or two, but our real focus was on the growing cocktail scene in the city. We were staying at the new Doubletree hotel, just a few minutes away from Centraal Station, and which was a perfect weekend base. We kicked off our first night in Amsterdam with a cocktail in the 11th floor SkyLounge, looking out over the city nightscape. We could even see the lights of planes taking off and landing in Schiphol.Yes, the music gets loud and irritating later in the night as the night crowd piles in, but it's still worth a stop while the bar is quiet. On our first night, we headed to Tales & Spirits, located in a lovely old building on Lijnbaanssteeg, close to Singel and Spui. Offering both cocktails and food, Tales & Spirits is always busy, so a reservation is a must (unlike us!). Despite the lack of a booking, we were invited to take a spot at the bar, where we eventually sourced two seats underneath the sparkling chandelier. Every cocktail comes with a bottle of water, reminding you to take it easy, as you enjoy the very well-made cocktails. Highlights included the Little Miss Troubles (€10), a mix of Bombay Sapphire Gin, fresh lemon juice, blackberry puree and Bols Elderflower served in a coupe and the Mai Luna-Tic (€12.50), a mix of Bacardi 8, Apollo 11, falernum, fresh lime juice and Tiki bitters, served in a rather naff Tiki cup. As we sipped our drinks, we watched the busy chefs send out dish after dish from the little kitchen. 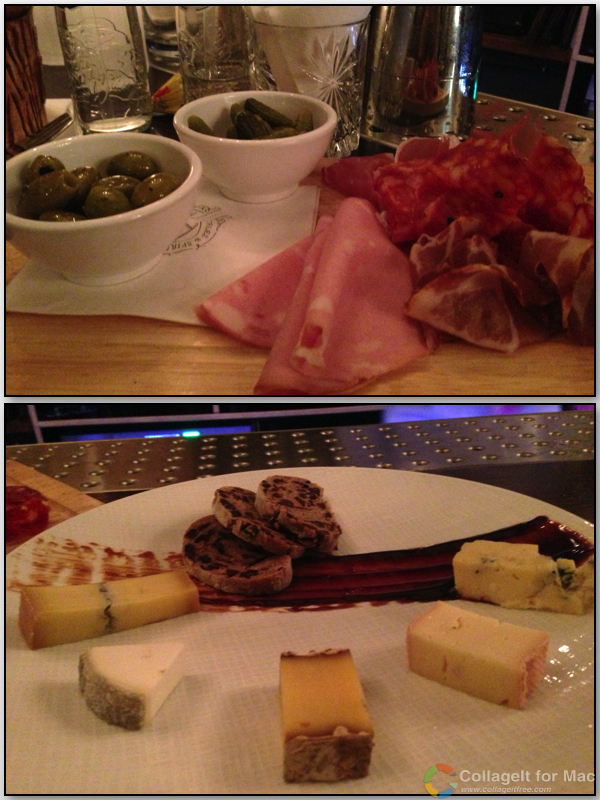 Soon, we found ourselves ordering a meat platter and a cheese platter. All components were excellent, especially sausage slices from the butcher located just across the street. 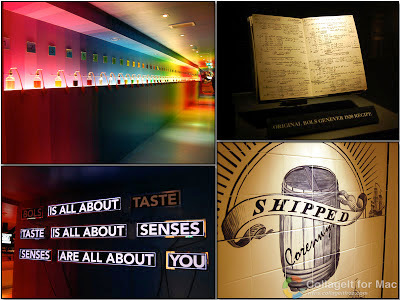 On Saturday morning (or early afternoon) we visited the House of Bols Experience. I had shopped many times at the Albert Heijn on Museumplein, but for some reason, I had never visited this exhibition about Bols, the longest distilled brand in the world. Tickets cost just €12.50 each, including a free cocktail of your choice at the end of the exhibition, with additional cocktails costing just €5 each. The exhibition maximises the amount of space available, and features a long gallery of atomiser jars where you have to guess each Bols flavour represented. It truly makes you realise how many different flavours Bols produces. Following the fun of exploring the senses, the exhibition switches to the history of Bols and particularly genever, the Dutch precursor to gin. There is even an old ledger notebook featuring the original Bols genever recipe as well as many little anecdotes about Bols history. Finally, you head upstairs to the glorious Mirror Bar, where you can select your cocktail of choice for the mixologists to whip up. Even though it was the middle of the day, we showed our dedication and stayed for an extra round. My definite favourite was a toffee yogurt cocktail which exceeded all my expectations on the taste front. On Saturday night we headed out onto the dark streets again, this time in search of Hiding in Plain Sight. Located in an old split-level bruin cafe on the corner of Rapenburg and Peperstraat, HPS is instantaneously captivating from the minute you enter. Once again, we didn't have a reservation, but the gracious host found two spaces for us amongst the low tables and comfortable old leather sofas. Cocktails at HPS are not for the light of heart. My Exquisite Corpse Reviver was a blend of mezcal, yellow Chartreuse, lime juice, agave syrup and fresh oregano (€14), with a wonderful smoky, salty flavour served in a heavy crystal glass. 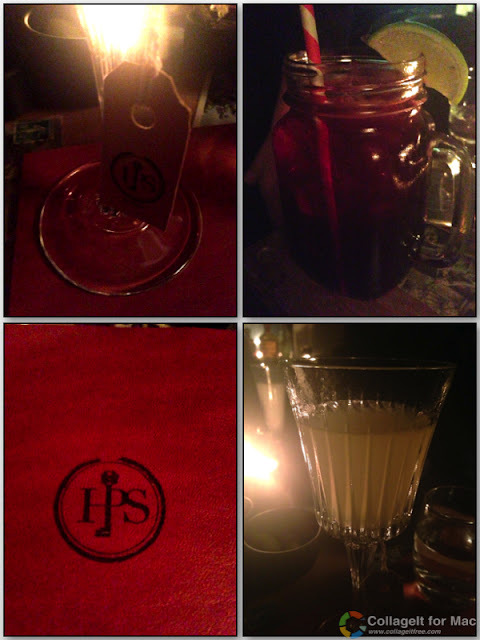 Later on, I supped on a traditional sorrel punch (€14) served in jam jar complete with handle and candy cane paper straw. Just like Tales & Spirits, regular top ups of water were provided to counteract the powerful drinks. Hiding in Plain Sight - Top right Traditional Sorrel Punch - bottom right Exquisite Corpse Reviver. 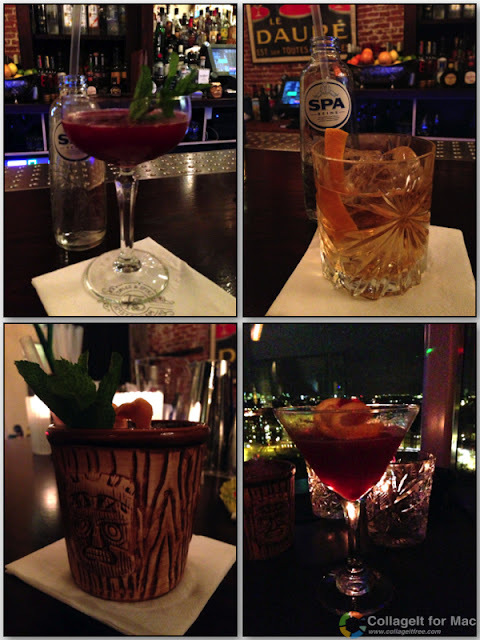 So there you go, a brief roundup of our cocktail tasting in Amsterdam. In the case of Tales & Spirits and Hiding in Plain Sight, the prices are higher than Dublin, but the experiences are sophisticated and mature. For a fun afternoon, the House of Bols Experience is well recommended and makes for a relatively cheap and informative drinking location.